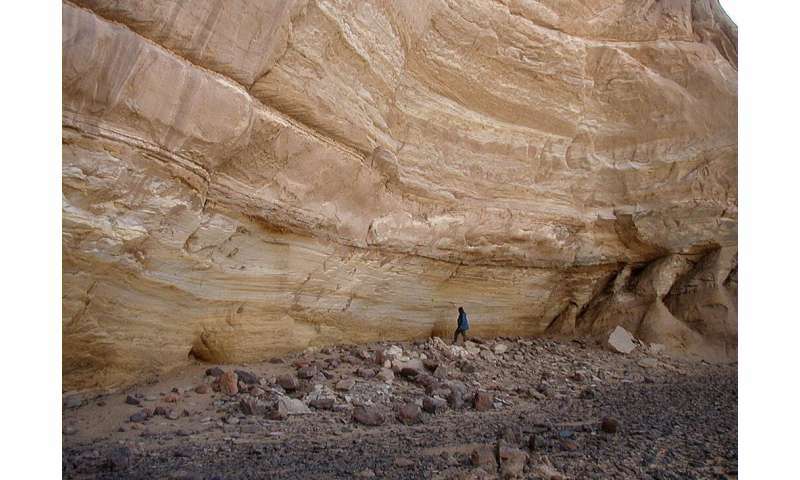 By analysing a prehistoric site in the Libyan desert, a team of researchers from the universities of Huddersfield, Rome and Modena & Reggio Emilia has been able to establish that people in Saharan Africa were cultivating and storing wild cereals 10,000 years ago. In addition to revelations about early agricultural practices, there could be a lesson for the future, if global warming leads to a necessity for alternative crops. The importance of find came together through a well-established official collaboration between the University of Huddersfield and the University of Modena & Reggio Emilia. The team has been investigating findings from an ancient rock shelter at a site named Takarkori in south-western Libya. It is desert now, but in the Holocene age, some 10,000 years ago, it was part of the "green Sahara" and wild cereals grew there. More than 200,000 seeds—in small circular concentrations—were discovered at Takarkori, which showed that hunter-gatherers developed an early form of agriculture by harvesting and storing crops. The investigation at Takarkori provided the first-known evidence of storage and cultivation of cereal seeds in Africa. The site has yielded other key discoveries, including the vestiges of a basket, woven from roots, that could have been used to gather the seeds. Also, chemical analysis of pottery from the site demonstrates that cereal soup and cheese were being produced. A new article that describes the latest findings and the lessons to be learned appears in the journal Nature Plants. Titled Plant behaviour from human imprints and the cultivation of wild cereals in Holocene Sahara, it is co-authored by Anna Maria Mercuri, Rita Fornaciari, Marina Gallinaro, Savino di Lernia and Dr. Vanin. One of the article's conclusions is that although the wild cereals, harvested by the people of the Holocene Sahara, are defined as "weeds" in modern agricultural terms, they could be an important food of the future. "The same behaviour that allowed these plants to survive in a changing environment in a remote past makes them some of the most likely possible candidates as staple resources in a coming future of global warming. They continue to be successfully exploited and cultivated in Africa today and are attracting the interest of scientists searching for new food resources," state the authors. Research based on findings at Takarkori continues. Dr. Vanin is supervising Ph.D. student Jennifer Pradelli—one of a cohort of doctoral candidates at the University of Huddersfield funded by a £1 million award from the Leverhulme Trust—and she is analysing insect evidence in order to learn more about the evolution of animal breeding at the site.